A couple of weeks ago I asked you all to email TMZ and politely demand that they release any information and photos they have received regarding Eli McCann. For 2 weeks you have been wondering what that was all about. Fine, I'll tell you. Daniel had the idea a while back to start emailing TMZ some scandalous information about me to see how they would respond to getting a lead on someone who isn't actually a celebrity. We argued about whether or not they would even reply to such an email, and the next thing I knew, TMZ was receiving correspondence from the likes of Peter Hansen, June Snapple, and others. Hey TMZ! I have access to Eli McCann and I am quite sure I could get you some incredibly scandalous photos. Where should I send them when I get them? Thanks for contacting TMZ. Can we check out the material? Thanks for getting back to me. I actually have quite a few from over the weekend that I think you would be very interested in. I have also recently come into some incredibly shocking email correspondence between McCann and a number of others. Probably enough for you to do an entire show on him. I have attached one of the photos. It's Eli McCann modeling a robe of some sort. This picture was sent to a number of someone that I'm sure you would be very interested to hear about. Can we get more info and view all of the photos? What would you like to know specifically? Recently I discovered that he has a cat hoarding problem so I've been trying to get some shots of him with some of the cats. I've been able to get a few here and there. I'm just not really sure what you're looking for. I need you to send more photos so we can view them. Just send all that you have and we'll take a look at them. 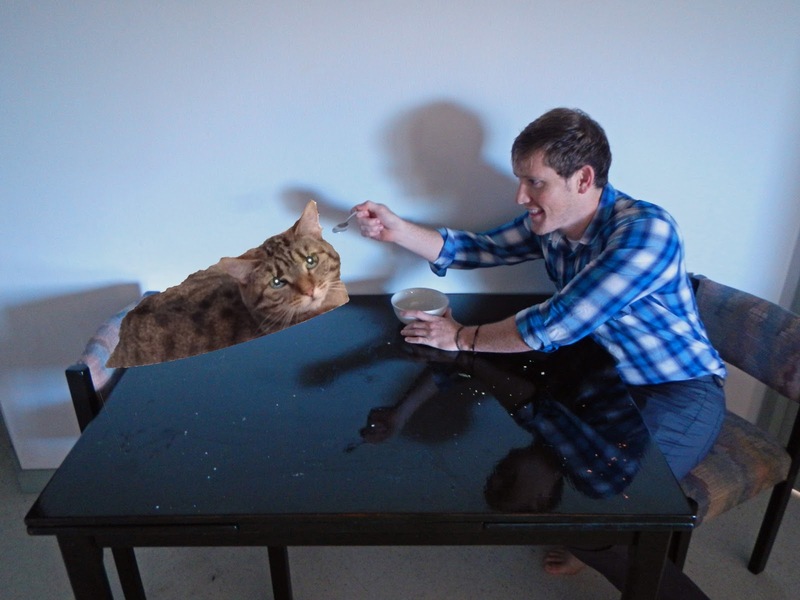 I recently snapped the attached photo of Eli McCann with one of his cats. I'm not sure who the woman is in the shot. One of the pieces of information I've recently come upon is that he is apparently in talks with The Amazing Race to join the show next season. This has been on the DL and in fact, most of the people at AR aren't even aware that this is happening. McCann himself has not discussed this with anyone. I have in my possession some proof of this. I have also come across some newer photos but I haven't yet verified whether they are in fact Eli McCann. I will have them looked at and let you know, if you are interested. How would you like to proceed? Would it be easier to chat over the phone or is email best for you? Ok, do you have any others? Or is this it? 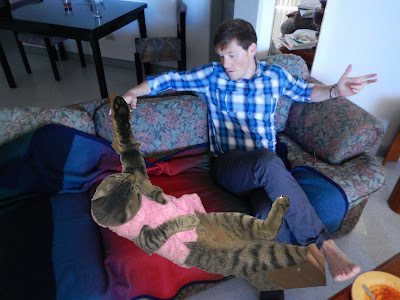 I have attached a new photo of Eli McCann getting attacked by a cat. I'm sure you'll find it very interesting. 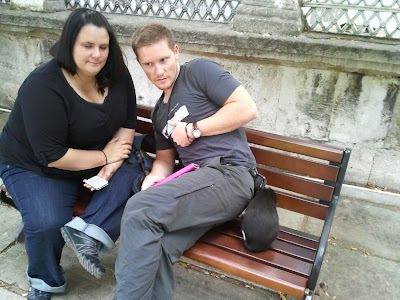 Currently trying to get more information on his talks with The Amazing Race. Apparently nobody knows about this yet. Please respond to this email or I will have to start taking my photos and information elsewhere. Haven't heard from you in a while. I guess you guys have probably heard about Eli McCann's cat blow-up over the weekend. Do you need photos of this? I can get some if you would like them. Yes, can we view them? I'm sure you guys are all over what has happened this weekend with Eli McCann. I haven't seen you publish any of the photos I have sent you. Why are you sitting on this? You have my permission to use them if that's what you are waiting for. Also, I think I might be able to get Eli McCann to give TMZ an exclusive interview. He has literally never done this before so it's a pretty big deal. What do you want me to do? Attached are a couple of new pictures I've taken of McCann in his home. I haven't yet been able to verify whether this is actually photo evidence of his relationship with Trixy Meowman. I will see what I can do! Just wondering whether TMZ is interested in doing something on Eli McCann, what with all the recent buzz. I have some photos of him and might have access to some information you may be interested in. Has TMZ been able to verify The Amazing Race rumors yet? I know it's been kept pretty under wraps. Diana, I would like to politely request that you release all of the info you have on Eli McCann. The public has a right to know. Diana, as a public servant, it is your duty to publish photos you might have received of Eli McCann. Millions of people are eagerly waiting to find out what is going on with him. In any event, this woman at TMZ got to work and found hundreds of emails in her inbox demanding information about some person who isn't even a celebrity. On what message board/forum is my email address published? What is the best number to reach you at? Great to hear from you! Message board? My number is [Jolyn's phone number]. I represent Trixy Meowman and it has recently come to our attention that TMZ is considering publishing incriminating photos of Trixy with Eli McCann. Trixy has recently completed shooting season one of Downton Tabby. When she heard about these photos getting leaked, she went on a tirade on her Twitter account. It is imperative that these images and this information regarding any alleged relationship with Eli McCann NOT be published. Trixy is willing to trade information for assurance that the photos will NOT be published. Trixy has also contacted the person who sent you the photos in order to cut off your source. Never mind. Will you please not publish any of the photos? I got in way over my head here. I'm thinking about getting a twiter account now just to follow Trixy..and great idea by the way, to bad TMZ doesn't know the opportunity they just missed. Just noticed the Roosters in the background... Hilarious!!! Wait...Queen of Colors was a Rooster? Hahahahaah the final email is awesome. "I got in way over my head here." Holy smokes. My stomach hurts. This is great. I just hyper ventilated because I was laughing so hard! Has Jolyn received a phone call from Diana? This is awesome. The world needs more Eli McCanns. I find it interesting that she kept asking to see more pictures and yet totally disinterested in the story at the same time. Maybe you should use some of those kitty "pin-up look a likes" next time. I love that you are harassing the harassers. I wish more people would do this to paparrazi organizations like TMZ. So entertaining. 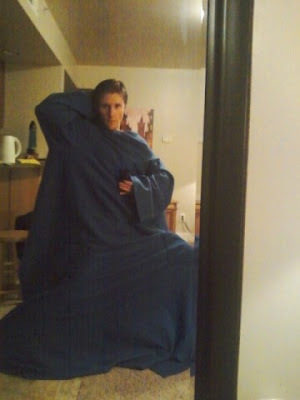 This is the best thing since STP2 (Snuggie Texts Part 2). I almost peed myself. Hahaha! Oh my gosh. I would SO watch Downton Tabby if it really did star Trixy. I missed you in the Presidential Election. What happened? Wow. Just wow. Speechless here. Eli, this is so unbelievably creative and funny. Thank you so much for posting so much great stuff. Write a book please! She is like the worst dirt-digger... She had your full name and couldn't find this site? ?